Less than a week later I’m still feeling energized from having spent time with our community in Bangalore, India. The energy, passion and dedication that is felt when filling one room with 80+ active volunteers who are working with you to help build communities and teach the web is just amazing. The weekend was filled with raging excitement, collaboration and yes, many many selfies. Mozcamp, an annual event at Mozilla, is undergoing a big transformation and this 2014 Mozcamp Beta was to act as a stepping stone to show how a historical event could bridge the gap between community building and training. In the past, Mozcamp had primarily focused on storytelling, collaboration and inspiration within our global community. Whereas now, it’s stepping over into a platform for individuals to get training and up-level their skills, tools and plans to broaden their community given a particular interest. Another big differentiating factor to this Mozcamp was that opposed to having individuals from all around the world come and train in one area, the new system focused on the individuals within one geographical area. This was one of my favourite changes as it really focuses on the needs of one group of people who can get ideas and collaborate with people closer to them. Plus, it’s a good opportunity to celebrate the previous work of one community and re-energize them for continued success. This fits in nicely with the idea that communities will take the Mozcamp framework and start to pilot their own in the future to allow for many Mozcamps around the world and training to bring in more community members at a global scale. India was the perfect place for a trial of the new Mozcamp format. It’s a constantly changing market and quickly growing, as well as being a big existing community within Mozilla. 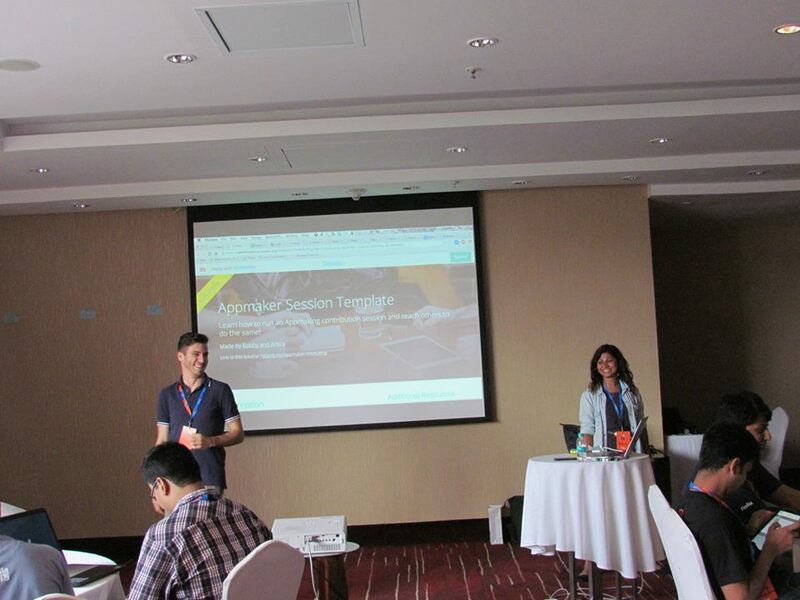 It was also a prime area as Firefox OS launches their $25 phone in the India and the event was a good opportunity to get our community thinking mobile and developing or teaching with mobile tools. It’s been a pleasure to work with many of the Indian community members in the last year. They are one of the most enthusiastic and dedicated communities I work with so it was exciting to get the opportunity to go and work even more closely with them and see the faces of people I talk to on a weekly basis. Bobby and I headed down with plans to run a half-day Appmaker workshop. While launching Webmaker’s newest tool, we were using Appmaker to teach how to contribute to the project, create apps for the marketplace and throw an event to teach/use Appmaker. You can find the full breakdown in this teaching kit. One of the greatest pieces of positive feedback we got was that “Appmaker bridges the gap between Webmaking and Firefox OS.” Often times the Webmaker project lives on the side of Firefox projects and there can appear to be a disconnect but Appmaker is a tool that naturally fits as a wedge between people who want to learn how to create apps and actually developing them for a marketplace. It was great to see the community feel the connection between the many Mozilla projects. People know there are many problems they want to fix but when asked on the spot to create an app on an issue that is important to them they often get blocked for ideas. Alternative avenues would be to have individuals solve one pre-determined universal problem or to create an updated version of an app they currently love. Once brainstorming with groups as to what to prototype we saw ideas ranging from Podcast apps to health apps that monitor and alert you when you need to drink more water. 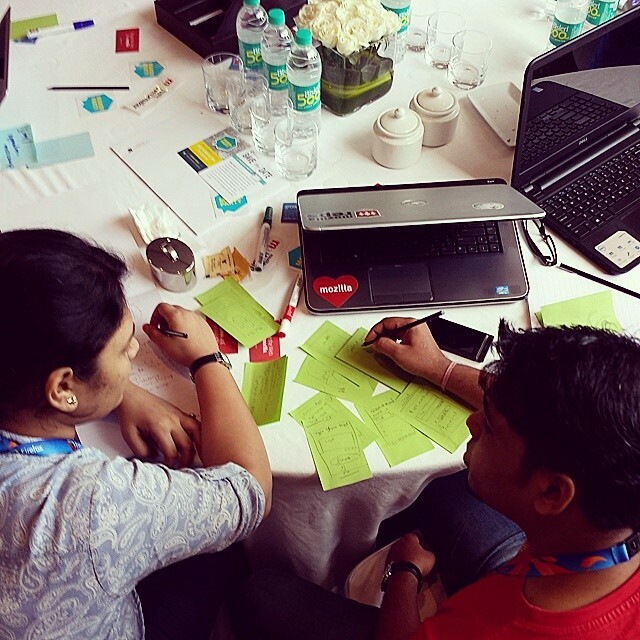 Though individuals are eager to jump into building apps, creating prototypes and going through the user experience on paper is a critical first step. Once completing prototypes and flushing out ideas, the groups were much better equipped to start building. I would actually recommend that the mobile templates came with space at the bottom where people can talk through the user experience and what they expect the user to do. After prototyping, a quick but valuable exercise would be to take someone through your paper prototypes as if they were using the app. Gather feedback on what they did, and if your app allowed them to do what to wanted. The more times I tested prototypes, the more groups kept improving the experience for a user. Tutorials, tutorials, tutorials. As Appmaker is still in development, this is something we will be moving towards but the need for both video tutorials and kits is high was reaffirmed in our workshop. Individuals are itching to do things on the platform but are lost as to where to start and how to come out with finished projects that they can use. There was a lot of technical specific feedback, to which I leave to Bobby to unpack and help the future of Appmaker. The rest of the weekend I dedicated to helping the community feel equipped to start teaching and running events in areas that interested them. There were a lot of Maker Party pros in the room and a large number of people who plan on running events during this summer’s campaign. Needless to say, I’m expecting a large dot on India in this years Maker Party map. Check out this great set of photo’s that Vineel took. Read this blog post from Abhishek, as awesome community members. Read this blog post for Sawrubh, another awesome community member.